The Tale of Peter Rabbit is a children's book by Beatrix Potter that was originally published in 1902. Now, more than a century later, the book and its title character remain popular. In Potter's lifetime, Peter Rabbit and her other stories became so lucrative that she was able to write children's books full time and become financially independent, a situation that was almost unheard of for a woman in that time. Peter Rabbit is the only boy in a family of four children. His three sisters, Flopsy, Mopsy, and Cotton-tail, are generally more obedient than he is. One day while his sisters are out, Peter decides to sneak into Mr. McGregor's garden, which his mother has ordered all of her children to avoid. Peter's mischievous streak outweighs any fear he feels at going into the garden, even though Mr. McGregor captured his father in the distant past and ate him for dinner. Once in the garden, Peter has a feast of all of Mr. McGregor's vegetables and eats himself into a stupor. Peter is caught unaware, and Mr. McGregor appears and begins to chase him. During the resulting kerfuffle, Peter loses his jacket and shoes but manages to make it back to his mother just in time. 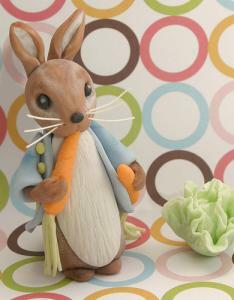 Peter Rabbit - The main character of the book and a frequent personality in many of Beatrix Potter's other stories, Peter Rabbit is a disobedient and rebellious young bunny. Mother Rabbit - Mother Rabbit is a practical, no-nonsense mom who cares more than anything about her little rabbits' safety and security. Many young readers will likely be able to compare her to their own mothers. Flopsy, Mopsy, and Cotton-tail - Peter's slightly more goody-two-shoes group of sisters who tend to obey Mother Rabbit's instructions. Mr. McGregor - As primary villain of The Tale of Peter Rabbit, Mr. McGregor is an imposing, severe farmer who has no qualms about catching and eating rabbits. Beatrix Potter was born in 1866 and initially made her living by teaching English and doing work related to fungi and mycology. She received plenty of individual attention while growing up due to her family's financial situation and ability to hire several governesses to educate her. 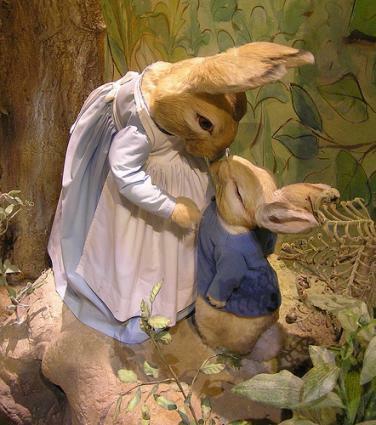 During her early adulthood, Potter wrote The Tale of Peter Rabbit. She shopped it around to several publishers, but it was ultimately rejected by all of them. Although Beatrix Potter's books about Peter Rabbit and other animals are now seem dated, they're still very relevant to today's readers and resonate with parents as well as children. The stories are best suited for the picture-book crowd, young children who are learning to read or going through elementary school, but they hold a special place in many older readers' hearts and minds as well.